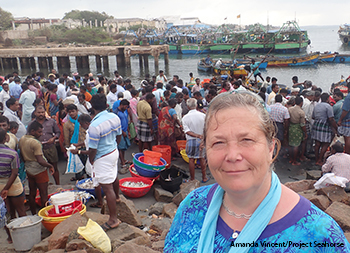 In September, Tanvi (our great PhD student from Chennai) and I spent two weeks in India roaming around the fisheries landing areas of the southern Tamil Nadu coast, the part that faces Sri Lanka. It was enthralling and appalling, the sort of work I really enjoy, even when it sickens me. Our goal was to introduce me to Tanvi’s field sites, scan some of the more worrying fisheries, and explore what might be done to fix the problems. Our focus was trawling which is a crazy, stupid, terminal form of fishing, chasing marine life without distinction. In this method, a boat – or far worse, two boats together – drag a weighted net across the bottom of the sea, extracting everything its path. The mouth is held open by two large slabs of wood or metal, called doors, and everything is funnelled down the net to a bag, called a cod end. Trawling catches pretty much all fish and invertebrates, even while wrecking habitats. It is the single biggest threat to seahorses, but they are hardly alone in that. Trawling is a devastatingly bad way to fish. Trawling in Tamil Nadu is worse even than in many other areas (and that’s saying something). The boats don’t even pretend to target particular species. They just go out to catch Life, however it presents. So the landing sites are filled with baskets of this, that and the other: sharks, rays, snappers, tunas, octopus, squid, catfish, moonfish, and a hundred other species. They are also stacked with piles and mounds of miscellaneous little creatures, animals that nobody can even bother sorting. In many places the miscellany far exceeds the stuff worth separating. In many places such piles are dismissively labelled as “trash fish”. The sorted catch gets auctioned off, species by species. The vast number of dead animals in the miscellany get sold as a job lot for chicken feed, often for one or two pennies per kilogramme. Yes, we are scouring the ocean floor and emptying it of life so that chickens can eat cheaply. It’s a pretty wild experience, going to a harbour at 10 pm, or 3 am, or any other time, to see the boats offload their catch. The place is swarming, buzzing and hopping as people dash about. They pile fish here, shift them there, and sell them everywhere. We sidestep crabs, hop over seers (mackerels) and weave among bloated pufferfish, all the while scanning the activity, taking photos and making mental notes. A lot people watch me, too, wondering what the heck brings me there. Tanvi is nearly as visible, as an urban Indian. Some landing sites are full of women, usually selling the baskets of lower value fish or sifting the rank piles of miscellany for anything edible or marketable that might have been overlooked. Their decorative ankle bells and toe rings contrast with, yet match, the silvery sheen of the dying fish. Scanning up, their colourful saris and salwar kameez (traditional outfit) relieve the gloom of this maritime graveyard. Yet further up, their faces, weather-beaten or beautifully smooth, indicate how many years they may have traded fish through worrying declines in catch. Many will be juggling complicated lives that leave them exhausted, filthy, and hungry. They grin at me, though, inviting me to take pictures, and telling me (through Tanvi) that “women are strong and must stick together”. It is the fate of these stalwart women shore workers that most worries me as the trawl fisheries wind to their inevitable end. Without a doubt, trawl fisheries must stop, be trashed themselves. And soon. Somewhat to Tanvi’s surprise, pretty much everybody we met stated the need to end trawling before we could: senior government officials in fisheries and forestry, representatives from fishers’ organizations, researchers, people from conservation groups… everybody. So the question isn’t whether, it’s how ? And that’s the sticking point. How do we end appalling fishing practices that employ a great many people, directly and indirectly? An enthralling – and very urgent – challenge.